Winter will soon be a distant memory, so it’s time to get the pool and patio cleaned up for fun in the sun. Even if your in-ground pool is functional, a lack of outdoor lighting can limit your use of it after the sun sets. Keep the fun going longer with a functional lighting plan from Creative Nightscapes. It’s inviting, and it will keep you and your guests safe. The best outdoor lighting plans are automated. Whether you’re using a timer that turns on the lights at a certain time or one that uses a sunlight sensor to determine when to light the night, you can keep the party going without having to pause to find the right switch. Post lights along the path from the back door to the pool, as well as around any other outdoor space that your guests tend to gather. Your number one concern when spending night hours around the pool is safety. Everybody needs to be able to see where the edge of the pool is at night. By placing several underwater lights along the rim of the pool, the water becomes both a reduced hazard and a centerpiece of light. Of course, you can always add some floating candles if you don’t intend to get wet tonight, which helps to create an electric and exotic atmosphere. If you want to avoid trips and falls, you and your guests need to be able to see where to place your feet. LED lights that are positioned every 3 feet or so along the path at knee height or lower provide just enough light to chase away the shadows without blinding your guests. Your eyes will always be struggling to adjust if your yard is a mix of spots of harsh brilliance and areas of pitch blackness. Instead, work with your lighting professional to achieve a dim but pleasant light level throughout the area for increased safety, comfort, and fun. Flames always create a dramatic counterpoint to the soft sounds of the pool. However, it is best to place your firepit well away from the edge of the pool since the bright flames cast harsh shadows that may make it more difficult to see the edge of the pool. To prevent nasty falls, select a separate area of the yard for your marshmallows and fireside sing-along. Now that you’ve got the poolside and patio illuminated, it’s time for the right outdoor dining mood lighting. With a little effort and some help from your lighting professionals, you can add a pergola over your outdoor table to create the illusion of an outdoor room. Wire in an outdoor chandelier and you now have a relaxing dining area. Having an outdoor dining space means that your party guests will leave their snacks on the table, which keeps the pool area free of clutter. It’s a win-win for everybody. Your pool isn’t the only feature of your backyard. 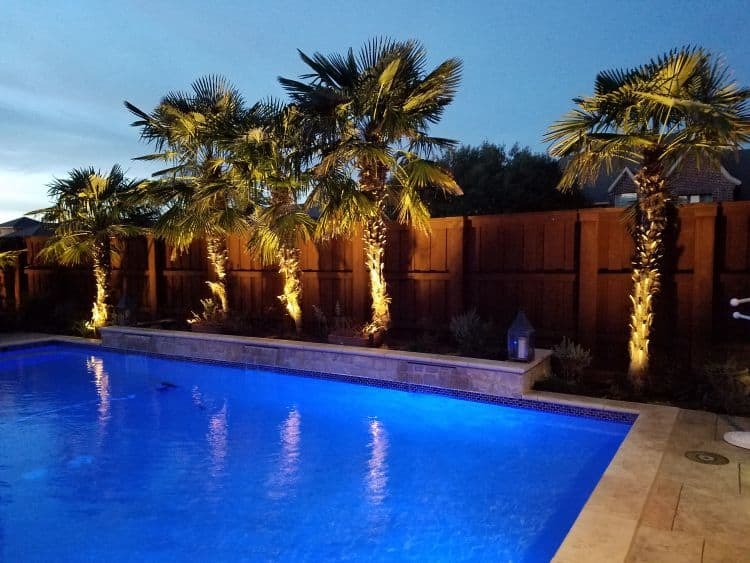 Complete your outdoor lighting design with carefully positioned uplights at the base of trees and behind dramatic shrubs. When you light up more of the backyard, your guests are invited to explore, which reduces the crowding around the pool. While working with your lighting designer, take a good look at the back of the house. That simple back porch light is going to be lost amidst your in-pool spots, the illuminated pergola, the firepit, and all those other lights. Consider adding a pair of handsome sconces on either side of the sliding patio door and a few downlights to give better definition to the architecture of the house. Once you have your lighting plan in place and wired up, it’s time for the beach balls, floating chairs, Tiki torches, and tunes so the party can begin. You’ll be partying at the newest hot spot in town without even having to leave your property. 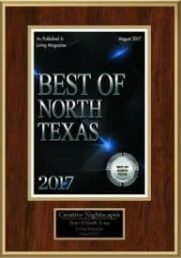 The folks at Creative Nightscapes look forward to creating a bold and beautiful lighting design for your Dallas/Fort Worth summer fun. Contact us today.